Pau San Valero, a Next Air Biotreat researcher, attended as a representative of the GI2AM research group of the Universitat de València to the 20th International Congress of Chemical and Process Engineering (CISHA 2012) and 15th Conference on Process Integration, Modelling and Optimisation for Energy Saving and Pollution Reduction (PRES 2012), which were held jointly in Prague on August 25-29 of 2012. 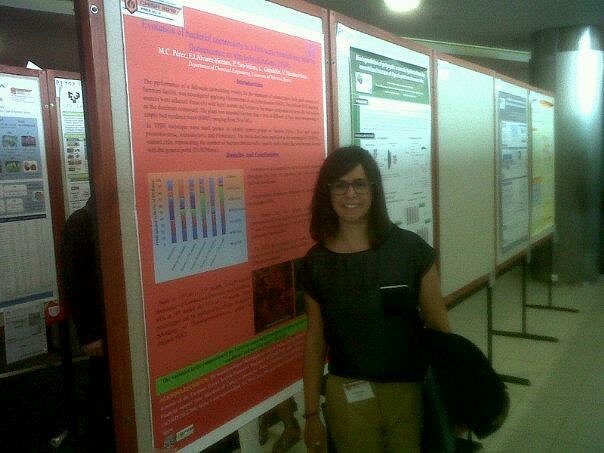 The research group presented two works cofounded by the Next Air Biotreat Project: a poster entitled “Evolution of bacterial community in a full-scale biotrickling filter by fluorescence in situ hybridization (FISH)”, and the oral communication presented by Pau San Valero focused on the study of mass oxygen transfer in biotrickling filters for air pollution control that will facilitate the selection of the packing material in these bioreactors. Both works have also been published in the open access journal Procedia Engineering from Elsevier publisher.